Last week I attended a small event called Mini MeG 1 that was organized by Dean from Olympian Games . 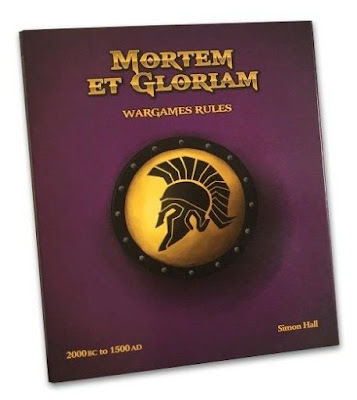 It was meant to be an opportunity for new players to learn how to play with the rules for a relatively new historical system called Mortem et Gloriam. The event was organized in the usual location for Canberra Regional Wargames Group whose members generously made some space for MeG players too! It was really great for me because I was looking for a chance to learn the rules as I have never played games in that system before. It has some unique (at least for me) mechanics I was curious to try out. But as with every new game it is really helpful to be able to play against a more experienced opponent rather than trying to figure out the things on my own. Equally important was to meet new people and see what armies and periods are their favorite. I hoped I would be able to make some new contacts to be able to play in a more regular way. We played two games as the idea was to have more time to learn the rules. 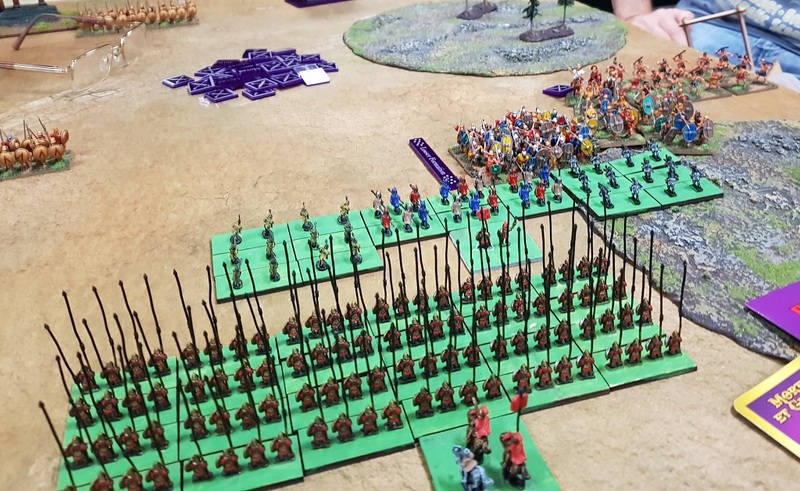 The size of armies was 7000 points, no more than 3 commanders and we played on 4 x 4' tables. In this post I will talk about the system how I understand it at the moment and present a short report from the first game. I started playing wargames in 90's when we had an access to games that allowed to fight historical battles such Vienna 1683, Tannenberg 1918 or Ardens 1944. 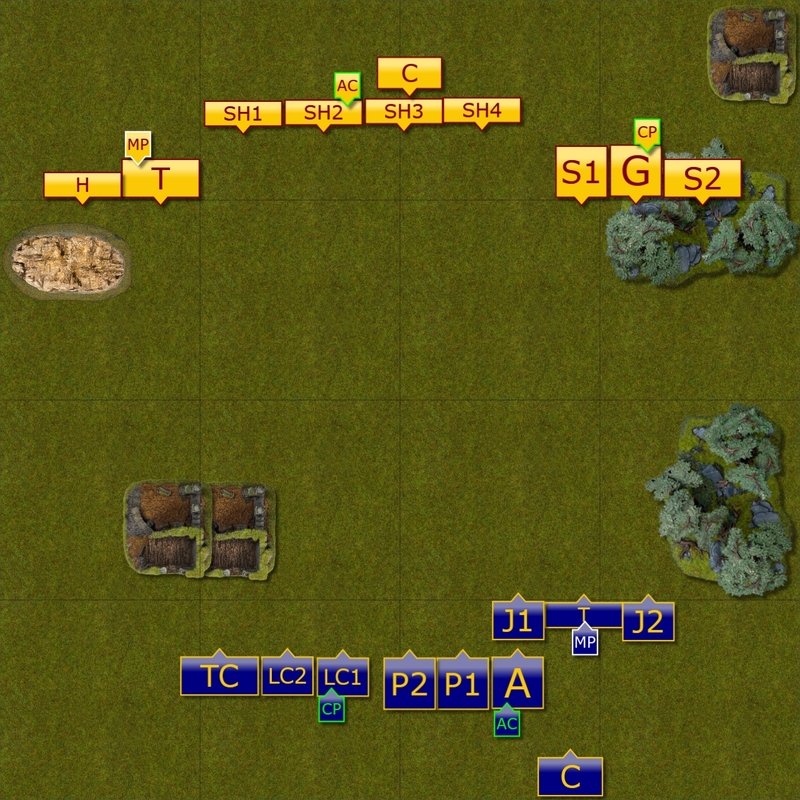 The battle was fought with the use of tokens positioned on a hexagonal map. Then my brother discovered table top games and we quickly switched to these. However, at the time only fantasy or sci-fi types of games were available to us. Hence, I have played the systems that were both available and where was a relatively regular group of people to play with. As a result, in order to satisfy the need to fight historical battles I often used available computer games, mainly from the Total War series. However, more and more different types of systems were available and each one of them tried to introduce new mechanics. My interest in historical wargaming was rekindled and I started collecting the rules for various games. Warhammer Ancients, Warmaster Ancients, Fields of Glory, Hail Ceasar - these were the main rules sets I managed to get. Unfortunately, even thought I knew plenty of people who played fantasy versions of first two, it was not so in the case of the historical ones. In addition, it was also a matter of getting new models which I was reluctant to buy when I didn't quite have anyone to play with. And so the pattern continued, I played wargames with fantasy systems (which I like a lot too! ), kept reading about ancient battles and occasionally played Rome Total War 2. By the end of 2017 my brother introduced me to Mortem et Gloriam. His gaming group has just started playing with these rules and he recommended them. Then I discovered that Dean from Olympian Games is distributing the rules and that my good friend has already purchased the set. After a few discussions I decided to give it a go too. Especially, that Dean was already organizing the fist event for MeG players in Canberra. 1. Pre-battle phase - very interesting element I have not seen in other games before. It represents the events during 5 days before the battle where both armies try to gain advantage by outscouting the enemy and getting to the favorable area. 2. Players perform actions in alternate order - in itself it is not completely new as I have seen it in another system before. However, I usually played games based on "I go - You go" principle. What is more, that alternate order is applied to almost all actions. Charging, shooting, moving, fighting etc. 3. Cards, special dice and measuring system - Cards and special dice, i.e. the dice with different probabilities of achieving desired effects are not new to me in general either. However, it was interesting to learn how cards and dice interact with each other, especially that different cards and/or dice need to be used in different circumstances. In addition, there is a distance unit in the game - Base Width and that scales with different scale of the models one uses for the battles. However, while the general principles of the game seemed to be clear from the beginning, then as is often the case, it was all about the details! I did not expect I would be able to remember them all after single reading but I knew I can learn them much faster while playing the games. But before that, I had to pick and assemble an army. It seems that 15mm scale is a very popular one for MeG at the moment and I must say it is very appealing. On one hand the miniatures have quite nice details to paint and make them look great on the battle field. On the other that scale also allows to field proper sized armies on 6 x 4 foot table easily. Unfortunately, I only had 10mm models to use but I was assure that as long as they are properly positioned on the right bases I can bring an army like that. Hence, I did some very basic painting in order to assemble and finish the army in time. I was very lucky to receive some very good advise on the composition of the army from Adrian, one of the Mortem et Gloriam FB page members. 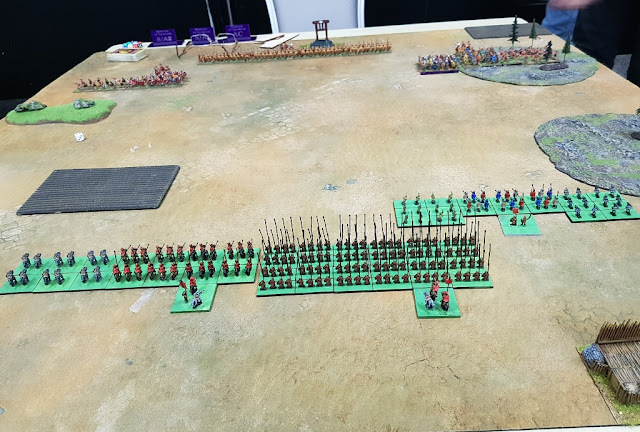 I needed to modify it a bit after the review of the models and I decided to field the small force of Seleucids from 218BC. Please, click on the list for the details. I was very keen to play with this army. It is always a challenge to come up with the composition of the force for a new system. However, I thought this army has enough elements for me to try and learn a lot of things. At the same time I wanted to follow the advise the author of the game put in the rule book - follow the way the type of army you play fought in historical battles. 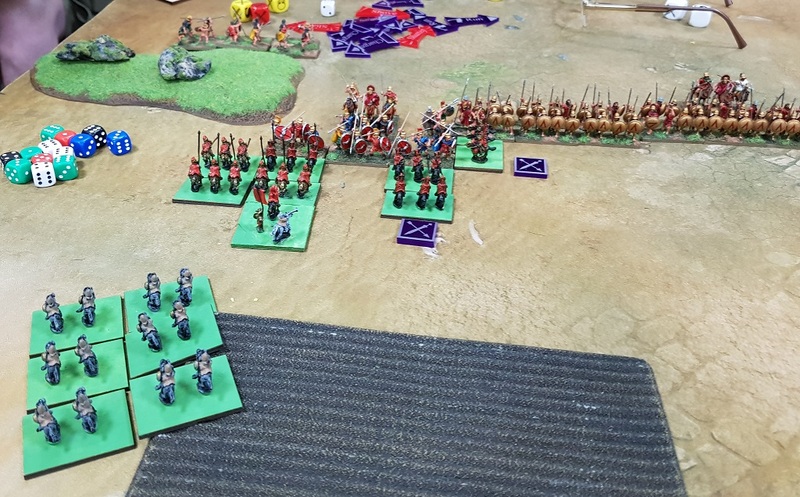 Hence, the very basic plan was to get the phalanx into a fight, use skirmishers to protect the flank and cavalry to go to the side of enemy formation. I mentioned I wanted to learn as much as possible about the new game. Pre-battle phase was one of the elements I really wanted to understand well. Based on the army specifics, Seleucid force fights in standard terrain and in plains. I guess they want to make sure the phalanx has nice, flat ground to roll on! I was the Defender in this game so I had to choose the first terrain area. I decided to take Rocky Ground or Woods as a secure flank to anchor my battle line on that side. Potentially, I thought my skirmishers would also use such terrain to advance towards the enemy with some protection. In addition, I also chose Plains as per army specifics. We had the same number of cards to use and in the end we had Standard, Normal terrain with Dense Woods on the secure flank. I was not yet sure if it is a good or bad for my army but we moved to the terrain placement before the battle. We got two dense Forests to be placed on the flank. We also got two pieces of ploughed ground and one rocky hill. Then was the time to find out who is going to outscout the opponent. I managed to get a bit better and out-scouted Geoff by 10%. Thus he deployed 3 f his TuG's first (for the size of the game it was scaled down to 3 instead of minimum 4 TuG's). Spartans deployed their camp a bit closer to the enemy, with all 4 TuG's of Spartan Hoplites (S1 - S4) in the center. One flank was covered by Thracians (T) and Helots (H) commanded by Mediocre Professional Sub-commander. The other, with dense forest, was chosen by Spaniards (S1), Gauls (G) and Slingers (S2). Seleucids deployed their Javelinmen (J1-J2) and Thracians to engage enemy on the right flank. The phalanx with one TuG of Agyraspides and two of Phalangites were in the middle. The cavalry was on the left flank, ready to turn towards any direction. (In my first ever game of MeG I wanted to focus on understanding how to move units. I did not know yet what kind of maneuvers they can execute so I decided to keep it simple. Engage the enemy on the right and keep them busy. Engage Thracians and Helots with my cavalry and break through this flank to threaten main battle line or the camp. Move phalanx forward and to the right to be able to clash with the Spartan Hoplites. However, by shifting to the right I wanted to use the depth of phalanx formation and fight against fewer TuG's to maximize the damage. Turn 1 - sequence of actions. Spartans seized the initiative and send their units on both flanks forward. Seleucids responded by shifting their skirmishers and Thracians towards the right flank in order to stop the advance of the enemy. The phalanx marched closely behind ready to support if necessary. At the same time, the cavalry moved forward to keep the enemy on the left flank in check. Armies are closing the distance to each other. Turn 2 - sequence of actions. Both armies kept advancing towards each other. The formations on the Seleucids right flank were almost at each other and phalanx shifted towards the forest a bit more. The cavalry was ordered to engage the enemy left but it proved to be difficult as main battle line of Spartan Hoplites quickly advanced to support the light troops. Positions of the armies just before the first clashes. Turn 3 - sequence of actions. Spaniards and Gauls initiated the attack on one flank but Javelinmen, encouraged by Thracians and in good defensive position decided to hold their ground. The difficult terrain significantly slowed down the attackers and the charge did not have the expected effect. On the opposite flank only on TuG of Seleucid's cavalry could charge their enemies but they took the risk. This attack hit hard but Spartan mercenaries still held their positions despite the losses. The melee on both flank intensified as both armies sent in additional units into the fight. Seleucids charged with the second cavalry TuG but despite that the mercenary Thracians on Spartan payroll kept fighting. Only Helots run away but that was expected.Surprisingly, the Hoplites also failed to break the cavalry despite the attack into their exposed flank. On the opposite side of the battle field, Seleucid Javelinmen finally broke from melee and Spartan skirmishers had more room to maneuver around the flank. However, due to prolonged maneuvers that lasted throughout the day, both armies decided to disengage. Neither of the commanders wanted to risk night fighting and both forces withdrew to respective camps to continue fighting next day. Thracian Mercenaries held their ground despite heavy losses! Unfortunately, we run out of time and had to finish our game in the moment when the balance of the battle was still shifting from one side to another. I would like to thank Geoff for his patience in explaining the rules and enthusiasm that made the experience even more entertaining. I am sorry we didn't finish the game but it took me some time to learn the maneuvers. It's a pity the main battle lines did not clash, it would have been great to see these formations fight! I guess I didn't move decisively enough to make it happen. However, I managed to learn the basics of the maneuvering and how the sequence of turn works which was extremely important for a beginner like myself. We also kept respective commanders with the blocks of units in order to upgrade the cards. That helped to be able to use black cards for white maneuvers, for example. There were a few situations where I simply didn't know how to proceed because I didn't remember the rule but Geoff helped in such circumstances. Sometimes I also got some rules wrong and moved in a way that didn't quite make sense. For example, I didn't remember that skirmishers cannot attack TuG's at full strength and I moved my Javelinmen to outflank Spaniards. But this way I can learn faster too so I would not do it again next time. I didn't quite take into account that the charge and subsequent melee may take some time to be resolved. And that a charge may not necessarily result in some decisive break through. Perhaps I would not have risked that attack with my cavalry against mercenary Thracians. I thought I may be able to eliminate that TuG before Spartan Hoplites attack but I was wrong. Although it took as significant amount of time to play only 4 turns of the game I didn't not feel the passing of time. I suspect it was due to the fact it was my first game but also due to the alternate actions system. It does require both players to be constantly focused. With newly acquired skills in basic maneuvers I was eager to start next battle to see if I could implement them well! Please, let me know what do you think about the battle report format. I hope it was an enjoyable read even though the game ended at the early stage. We definitely have been jumping on the 10mm bandwagon in my area, and I am painting a 3000 point Herd list for KoW 10mm currently! I have not heard of this particular system that you are trying out and, admittedly, I haven’t played any historical system during my gaming career. Having not played a historical system, that makes the learning curve a little bit greater when it comes to trying to follow a battle report. I do think the diagram did a great job of showing the order and outcomes of actions so that was very well done. You also did a great job explaining the phases. I love the pre-battle phase and hope that KoW vanguard is able to add in flavor like that to regular KoW games. In future reports, as you learn the rules better, continue to add in more about the different kinds of maneuvers and special rules for units which will make understanding your moves and choices easier. I think you did a great job for a first report on a new system, and I feel like I learned a fair amount about the general workings of the system. So as you learn more about the system, you can add in info about part of the game before the actual report like you did on this one (special unit rules or common maneuvers, for example) and your readers can grow in understanding along with you. Consider me interested, and I look forward to learning a little bit more about this system through your journey with it. I did think about Small Scale KoW, in particular in its Historical version but I don't think locally people have armies for it. I also considered using my Warmaster army for that purpose (possibly with some additional bases to match the recommended dimensions) as well as assembling and painting 10mm models for Seleucids. I am glad you found my description of Mortem et Gloriam informative. It is a challenge to do so, especially from the point of view of a beginner. After all, I am the one who would rather read something like that. However, I came to the conclusion that I can about the game the way I understand it at the moment. Thus I can focus on elements that stand out for me and perhaps not overwhelm the reader with the details that I don't yet understand myself. I will do my best to keep adding more elements to the reports. I was glad to notice I managed to learn enough of the movement rules to be able to maneuver more efficiently in game 2. That created a set of new challenges but I believe it will be clear what got improved when I report on the battle. I like the GIF diagrams because they also allow me to understand the flow of battle better. But I admit that it is time consuming to create one and I expect it will be more so in the future games. For example, the fact that you can charge, resolve the outcome of the charge, then shoot, move and fight again in the same turn makes it challenging to keep track of. I have already tried to take a quick photo after each action taken. But I am not sure if it is going to be feasible in bigger games. At the moment, however, I found it enjoyable and I hope I will be able to keep playing with Mortem et Gloriam regularly enough. Despite the number of options to remember I hope it is going to be the game that is relatively quick to learn so that one can focus on outplaying the opponent rather than constantly checking the rulebook. I will do my best to post part 2 soon! Its an awesome format Pawel. What you will find is that in MeG your really want to force the game with your main battle troops. Get those pike blocks into things a good things happen - at least for you! Have fun. Thank you! I am very glad to know that you like it and I greatly appreciate your kind words! That was one of my main lessons from the game and in the next battle I made sure that pikes got into melee.